I wear this cross around my neck, sometimes never giving it a thought. It is so much a part of me that I often take for granted what it represents. To me, it symbolizes my faith. 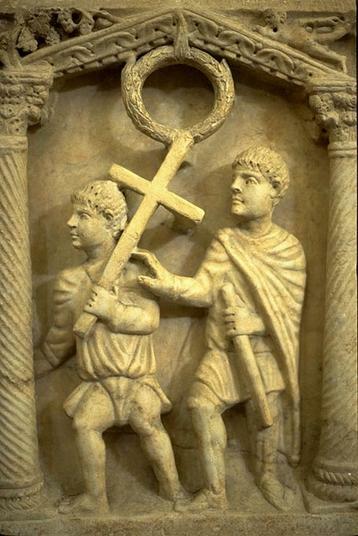 But to early Christians, the cross held a much more complicated meaning. Judith Couchman opens Part Three–Early Signs of Faith–of her book The Mystery of the Cross with a quote from Richard Taylor. This cross that I wear, for the disciples, must have brought to mind vivid images of the terrible last hours Christ faced. I picture them, huddled together after Jesus’ death, with the doors locked for fear of the Jews (John 20:19), and I am amazed at what Couchman tells us in chapter ten. Of the twelve disciples, only John died a natural death. Depending upon the source consulted, up to six were crucified. When the apostle Paul wrote, ‘I have been crucified with Christ’, the possibility of a literal crucifixion loomed nearby. Couchman tells us that not one of the disciples recanted his faith in the end. How did such a group of scarety-pants come to such a bold end? On the way to Jerusalem that day, Jesus told his friends three times that he would be tortured and killed. Yet they argued amongst themselves about who was the greatest. They just didn’t get it. It took the Holy Spirit to transform them. Yet, even after the resurrection and Pentecost, the cross must have been a difficult image for those closest to Jesus to embrace. Couchman tells us that it wasn’t until the fifth century that crucifixes emerged in Christian artwork, and not until the seventh century were depictions of this instrument of the Christ’s death common. Even as the early Christians shied away from visual depictions of the cross due to persecution, artwork displaying themes from the Hebrew scriptures flourished up until the fourth century. The story of Jonah is the most popular subject, followed by Noah’s Ark, Moses striking the rock, Abraham’s offering up of Isaac, Adam and Eve, and Daniel in the lion’s den. These strong Jewish themes make sense, according to Couchman. She points out that it wasn’t until after the destruction of Jerusalem in A.D. 70 that Christianity truly distinguished itself from Judiasm. During this time of noticeable absence of the crucifixion in Christian art, its meaning was not absent in the lives of those early believers. Couchman speaks of the dominance of crypto-crosses—such as the masts of ships and anchors, of early apologists who wrote of seeing the cross everywhere in life and nature, and of the common practice of crossing oneself during worship. Compared to the early Christian martyrs, my challenges seem small. I don’t live in a country that demands a martyr’s death for my faith. Even so, God wants to conform me to the image of Christ, and life continually serves up repeated opportunities to persevere, to be crucified with Christ, to put something within me to death so life can spring up. I can choose to engage the cross, humbly submit and die to myself. I need to forsake the sins and habits that forsake my soul, but too often I engage them without considering the consequences. Everyday I struggle with this choice to engage the cross. Understanding a bit of its place in history encourages me in this struggle. I wear this cross around my neck. To me, it means everything. Enjoyed this post, thanks for sharing this perspective! I love this kind of history of the early Christian church. It's particularly cool to see how the symbols that the first Christians identified with are very different from those that we identify with today. Laura, I totally agree with you on how a study like this enriches our understanding of the cross. I've always had a sense of reverence of the cross, but I'm discovering a much deeper respect and sense of awe for what it means. Thanks guys. I'm enjoying the book so far.